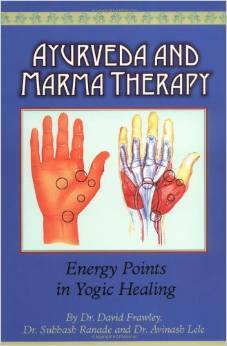 AYURVEDA AND MARMA THERAPY is the first book on marma therapy published in the West. It clearly describes the 107 main marma points in location, properties and usage. It explains in detail how to treat marma points with many methods including massage, aromas, herbs, pranic healing and yoga practices. Ayurveda and Marma Therapy is an essential reference guide for all students of Yoga, Ayurveda, massage or natural healing. It has been one of the best selling books in its field. Required reference book for our Advanced Yoga and Ayurveda course and recommended reading for our Ayurvedic Healing course.